My fellow artist, Bonnie Landau, teaches a class called "Anyone Can Paint." She invited me to attend a couple of weeks ago, and encouraged me to share my technique with her students. Early in my career, I had a lot to learn. I studied with Rassouli and Fusionart and learned the things I needed to know. Now I am at the point in my art where the important thing is for me to forget those basics, and paint without constraints. Painting through forgetting gives me power and unlimited access to my talent. Discipline, media, form and function; these comprise the ground rules of art. True talent is the ability to simultaneously know and break the rules. Painting from knowing the rules and breaking through them is power. Painting from not knowing the rules is merely accidental. There is a world of distinction between the two. Think about some familiar paintings. It's obvious when the artist has learned the rules, and then found an expressive path that bypasses convention. Obvious examples include Picasso, Van Gogh and Modigliani. Each took something recognizable and transformed it into something that surpassed its reality. Each artist was a major rule-breaker! Now when I paint, I ignore the rules. They are there, but at arms length. I have no expectation for my work to look like anything or be compared to anyone else's. I don't think; I DO. And when I'm done, I am amazed at what I've created. Realizing this, I put away the worry of how to prepare for Bonnie's class. Other than knowing I had canvas and paint, I had no expectation of how to teach people to create. I invented the class as I went along, and we were all very much in the moment. We used our hands, brushes, sticks, anything we liked to put the paint on the canvas. We didn't worry about going over someone else's work or about "getting it right". We played, secure in our basic knowledge of creativity. 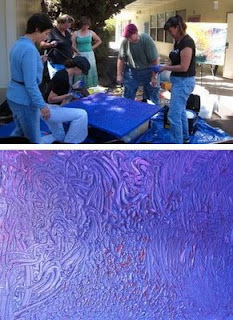 The result was astounding; a rich, textural painting that is alive with all our energy. Thanks to Bonnie Landau, Claudine Manning, Christina Maria, Orma Hammond, Hope Goss, Sonia Madixx and Shain Requicha. We were able to forget the rules and create without limits! 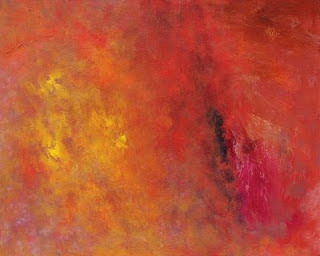 This painting is the collaboration of two old friends who were surprised to discover that they shared a passion for art. I have known Mehrdad Dabbagh for 18 years, but in a completely different context - the world of business. I really did not know Mehrdad’s spirit until I met him in one of Rassouli's classes three years ago. No one can describe the expression on his face when he first saw me in the art class. It was like seeing someone from another world that you never imagined you would see in the world of art. I have lived my life as a non artist. I am an engineer. An analytical business consultant who helps people design their businesses for profit. I help people design the systems and structures that make a business run and make money. I have been doing this for the past 18 years. I have been an entrepreneur for over 50 years. No one in my life, including myself, and certainly not Mehrdad, ever expected me to make the transformation into being a painter and artist. Through the teaching of the Master Rassouli, I have bridged the gap and made that transition. In the process I have found a new friend in my old acquaintance Mehrdad. I found him to be a talented artist who paints with passion and emotion. This painting began with the two of us playing in class one day. We just started sharing the canvas. We each worked on one side, and then we turned the canvas and we worked on top of each other's work. There was no plan. There was no drawing. There was no blueprint. (Mehrdad also happens to be an architect.) We just kept playing and having fun. As the music changed the beating of our brushes on the canvas got faster and faster. The energy was jumping as we raced to place more paint on the canvas. I consider this to be an example of the meeting of two worlds. Two people from different countries with different backgrounds. Even though for years they thought they knew each other, they did not. Their souls met through a mutual experience on canvas with brush and paint. I have placed the value of this painting at $10,000 - the highest price in my collection. It is the painting that took the longest time and most distance traveled to create. This is an example of the meaning of our Fusionart Movement. When we all surrender to the creative process; that is when the journey begins. This painting is a celebration of that transformation and the connection we can all share through art.